Do I have a fun DIY project for you today! You might have seen a little sneak peek when I shared our home decor on Tuesday. 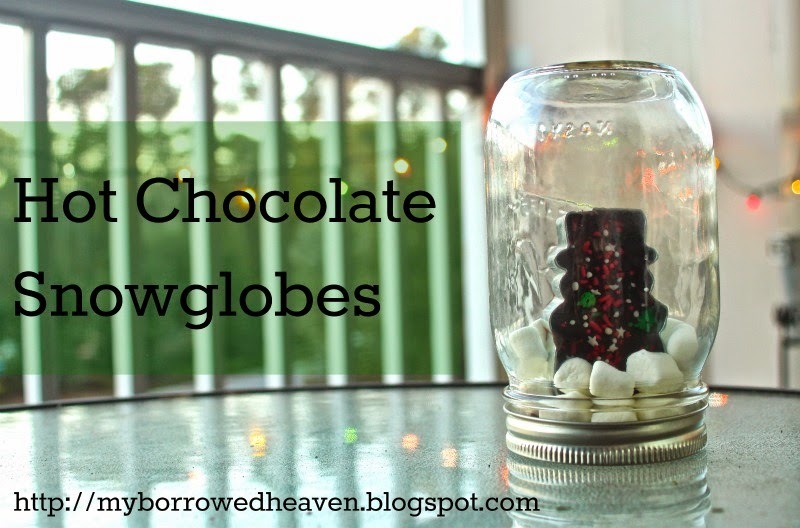 While scouring Pinterest, I came across lots of ideas for Mason Jar Snowglobes, but if you know me at all, I am all about crafts that can also be delicious treats. I came up with this idea when I found these adorable mini cookie cutters (while walking around Target's Christmas section for the millionth time). This whole project is easy to put together, pretty, you can really shake it like a snowglobe, and you can make it into hot chocolate when Christmas is over! If those reasons don't win you over, I don't know what will! There are really two parts to this crafts: making the hot chocolate and putting it together. Everything you see below will make 2 globes. Melt your chocolate together, and once melted, add the milk. 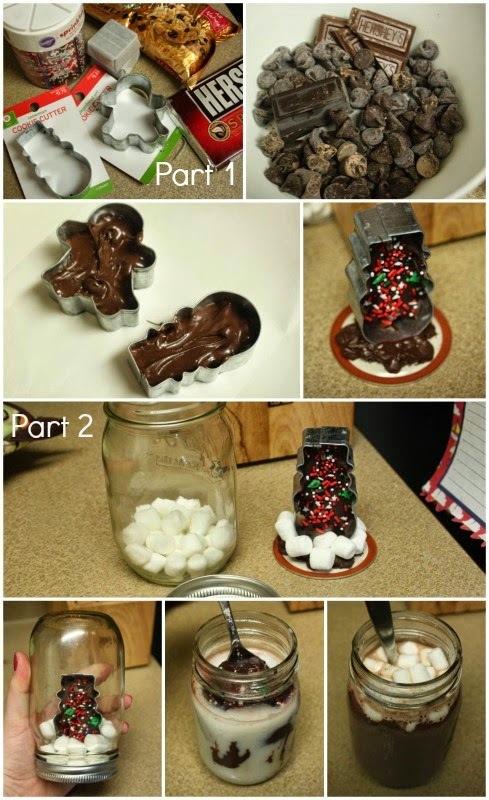 Pour chocolate mixture into cookie cutters on wax paper, and decorate with sprinkles. Let these harden before continuing on. Start to melt a handful of chocolate chips, but don't melt them all the way. You want there to still be some hard chocolate chunks, as this makes the best chocolate "glue." Scoop some of the semi-melted chips onto the lid of the mason jar, place the cookie cutter on top, and cover chocolate with marshmallows. 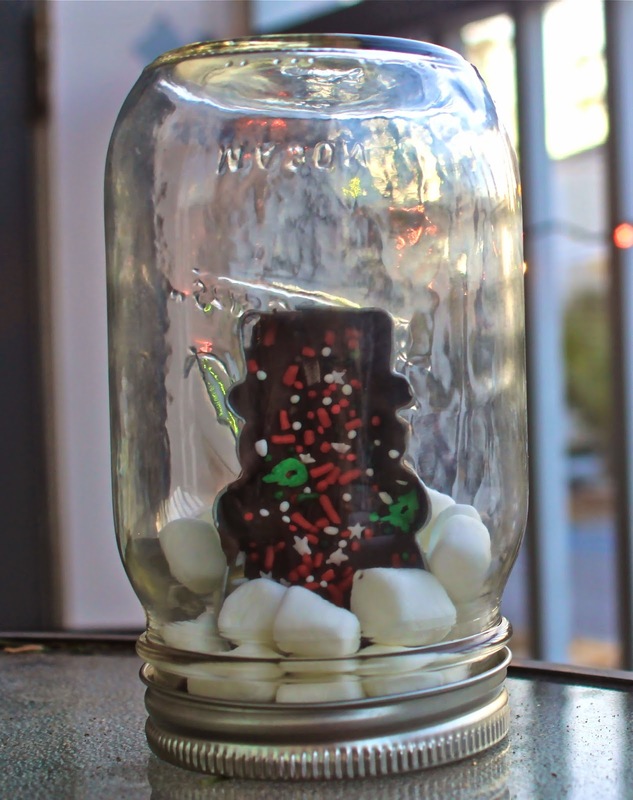 Once this is dry, place more marshmallows in the mason jar, secure the base to the jar, and shake it up! Lastly, to make the hot chocolate, I fill the mason jar with half hot milk and half hot water, and stir until all the chocolate is dissolved. Don't forget to take out the cookie cutter and save it for next year! Oh my gosh... that is such a cute idea!!!! This is genius and so unique! Such a cute idea and fun for a gift. Meg this is darling!!! Love this idea thanks for sharing!!! How cute are you!!! This is genius! !